For once, there is not much on the Closed Session agenda for the upcoming Tustin City Council meeting on Tuesday. Don’t expect any report from the city attorney. At the meeting two weeks ago, everyone on the dais attempted to dodge the bullet when a speaker, during public comments, brought up noise and traffic at the Wilcox Manor. The Mayor Puckett couldn’t foist it off on the police chief fast enough. The good news is, Silent Mike and Lindburgh have been complying with the terms of their conditional use permit and Tustin PD reports no glaring discrepancies. In fact, there have been only three complaints, all apparently resolved. The sole Public Hearing on the Regular Agenda is Item 1, Community Development Block Grant 2015-20120. This year, the city is required to submit the 5 year Consolidated Plan that identifies community needs and proposals for funding. The draft list prepared by city staff is pretty extensive and includes parks, parklets and expansion of Old Town parking. It also includes street and infrastructure improvements and rehab. Some of the more interesting proposals include economic development of Tustin, particularly the Old Town area. A lot of time and effort by staff has recently been put into developing a plan of sorts for the development of Old Town. Unfortunately, until there is some movement by principal property owners, it’s doubtful there will be much more construction taking place. Still, its good to see the city finally paying attention to our legacy. All currently funded projects previously selected for this three year period by the Tustin Community Foundation will continue to receive CDBG money. There is not much on the Consent Calendar to be concerned about. Most items are administrative and recurring. Item 7, Renewal of Field Services 4/10 Work Schedule, is a renewal of a pilot project from the past few years for field service personnel to work 4/10 schedules during daylight savings time. This is a union negotiated item that should probably become permanent. Item 8, Approval of Operator Services Agreement for Carnival Rides- The previous agreement with Shamrock Shows expired and the city is preparing to sign with Brass Ring Amusements for rides and concessions. The new agreement also pushes more money into city coffers with the city’s take beginning at 25% of gross receipts. It’s interesting to note the city now requires background checks on all carnival employees due to an issue a few years back. Brass Ring Amusements, by the way, is pretty well established and is scheduled to run more than 15 California fairs this year. So, expect a quality ride. Under Regular Business, the city is finally going to utilize the event center they established at the old Regal Theater in the Tustin Market Place. Item 9, Recommendation of the City Use of 12 Events at the Community Center, recommends 12 city sponsored events to be held at no charge to the city. The ad hoc committee of Councilmembers Gomez and Nielsen came up with a list of spine-tingling events that will include (in no particular order) a talent contest, a youth film festival and a new (did I say free?) place to hold the State of the City Address. The final item on the agenda is Item 10, Formation of Veterans Advisory Committee/Commission. Normally, I would be cheering the formation of anything for veterans. But, this is a topic brought up by none other than, Mayor pro tem, John Nielsen. There are a couple of reasons for concern. First, is Nielsen’s apparent collaboration with his ally, former councilman Jerry Amante. Amante, if you recall, had a feud with The American Legion Post 227 that subjected them to some humiliation and all but eliminated the color guard ceremonies that were being held in council chambers each month. That rift between the Legion Post Commander and the city council began as a small tiff when, way back in 2001, Legionnaires came to the rescue by reviving their post and touching off the first (in a long time) Veterans Day parade down El Camino Real. I witnessed the buildup and slow degradation of what was hailed by the OC Board of Supervisors at the time as “Orange County’s Veterans Day Parade”, into a less substantial day in the park due mostly to the hostility of the city council toward veterans. I’m not even sure there is a celebration in Tustin anymore. Should we mention their one-time desire to do away with the blimp hangars? A second reason for suspicion -and that ties in handily to vet loving by John- is the rumor recently making the rounds that John Nielsen may make a run for the California Assembly. Normally, I would dismiss a notion like this as someone’s idea of a nightmare on Elm Street. That is, until I heard it from two distinctly different sources, one of whom does not live in the city. So, is Nielsen simply paying homage to veterans in order to regain some traction here on the home front? Certainly, he has lost interest in any business the council conducts, as it is apparent he has been treading water, at least since the election. We did email Nielsen on his intentions but he has, so far, refused to respond to us. One other item of note, Old Town residents received a Notice of Publice Hearing on a code amendment. The hearing, to be held February 24, 2015 at 7 pm (Planning Commission Meeting), will be to hear public comment on a proposal to change second residence requirements. The proposed amendments would eliminate “accessory guest rooms” or what most of us would call, “granny flats”. in lieu of establishing new guidelines for 2nd residential units on lots. If you can only go to one meeting, this may be the one. There were no surprises in the recent off-year elections. Al Murray and Beckie Gomez were re-elected to their respective posts as were the TUSD incumbents. It is disappointing to see that not much has changed since the days of Il Duce Amante and his reign of terror over the city.What I am talking about, of course, is the obvious disrespect the good ol’ boys show the only female on the dais by not electing her Mayor for at least one term. It not only shows their true color as chauvinists but borders on discrimination as they are all cut from the same political cloth. Fortunately, the Mayor’s post, in this city, is largely ceremonial with the setting of the agenda probably the most important task. Yet, the Funtastic Four could not see fit to give up even that small amount of power to a woman. That said, we’ll congratulate Mayor Chuck Puckett to his (re-)ascension to the throne. Anyone care to guess who the next mayor will be? In closed session tonight, the council will have opening discussions on upcoming labor negotiations with city unions. After the fabulous way they treated the upper crust management last year, everyone should be expecting a reasonable raise. City negotiators lamented the low sales tax return and the high cost of running the city last year, using it as an excuse to not cut a square deal with the employees. That excuse has run its course. We’ll see if the employees are willing to take a stand for a raise this year. Likewise, in closed session, the city has several property negotations to discuss. This includes a property swap with the Tustin Unified School District. Also under discussion is property negotiations with Arte Moreno’s group, Pacific Coast Investors. The line item says, “Price and Terms of Payment”. Let’s hope it is not for the new Angels-of-Anaheim-at-Tustin stadium. And what is the status of those negotiations, anyway? First up on the Regular Session, after the usual opening prayer and Closed Session report, is a presentation to Tustin Community Foundation from the website, Great Nonprofits. TCF has been named a Top Rated 2014 charity by them. It’s nice but doesn’t really mean much. Great Nonprofits appears to base their selection on consumer reviews. Think Yelp for charities. I read a few of the more than three pages worth of “reviews” and find them…..well, contrived. At first, this may seem like a good idea. After all, consumers commonly use reviews on sites like Yelp and Trip Advisor to help them choose restaurants and hotels. What is wrong with using crowdsourced reviews to help donors pick nonprofits? One problem is that reviewing nonprofits is far more complex than reviewing consumer products and services. When a customer at a restaurant pays for a meal, he can smell, taste, and experience it. In contrast, when a donor gives to a charity, he pays for goods or services that someone else receives. His review is often not based on any firsthand knowledge of the quality or efficiency of the charity’s programs. As an example, Charity Watch points out that the Childhood Leukemia Foundation received a “nearly perfect score” from GNP while their own website rated it an “F” because and in-depth look at their finances revealed dismal performance in areas that count. And, while Doctors Without Borders received an “A” rating from Charity Watch, GNP gave it a mere 3.5 stars (out of 5) due to two poor reviews, neither of which was of a significant issue pertaining to their actual performance. Neither Charity Watch or Charity Navigator rate TCF. Charity Navigator does not rate charities with less than a million dollars in revenue. Oh, and of the 32 reviews, 30 of which are five star, only one is from a recipient. The rest are written by volunteers, board members and others with significant ties to TCF. Curiously, two reviews from volunteers rated the foundation as only four star. What’s up with that? Now, we’re not saying Tustin Community Foundation is a poor choice. On the contrary, TCF has done some nice things here in Tustin. What we are saying is, awards from questionable sources might better be forgotten than noted in a public city council meeting. Item 5, Establish Prima Facie Speed Limits on City Streets, is the result of required studies by the state. Streets are required to be surveyed for appropriate speed limit changes in order for the city to continue to use radar and other traffic control methods. Eleven streets have been designated for increased or establishing speed limits. Interestingly, sixteen segments, including most of Newport Avenue North of Irvine Boulevard, have recommendations to lower the limit. The rest will be unaffected. Some of these changes are in rather unobtrusive locations so, make sure you remain aware lest you be stopped by one of Tustin’s Finest. Item 11, Community Development Department Office Reconfiguration, is really an item that could wait until next year. The darling of the City Council, Elizabeth Binsack, is requesting an additional $68,000 in her coffers to accomplish the remodel which, quite frankly, should not be coming out of additional reserves. This sort of smacks of the Jerry Amante iPad debacle (where are those iPads, anyway?) where funds were allocated for a folly. Expect this item, as well, to be approved without comment. It’s nice to be the apple of someone’s eye. Under Regular Business, several items stand out for discussion. 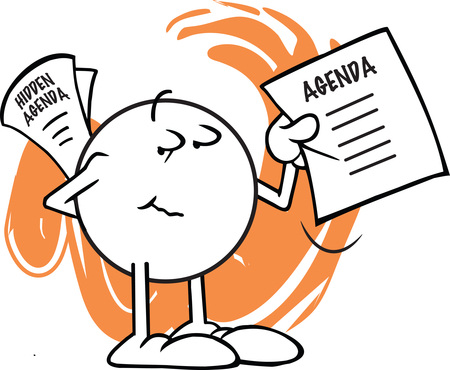 The first is Item 14, Local Appointments List which publishes for the first time, the list of appointment to OCTA, the Water and Sewer Boards, as well as a slew of other paid and non-paid appointments. The Mayor has an opportunity to redeem himself and his cronies by appointing their arch-nemesis to at least one important (and paying) board position (not that the Library Board isn’t important). He could but don’t expect him to. Chuck has never been one to rock the city boat. Other Regular Business items include a grant application to the National Endowment for the Arts to assist in funding the Tustin Pioneers Recognition Program and the transfer of city owned property to the Orange County Rescue Mission. The Tustin Pioneers Recognition Program, if you recall, would allow the city and certain organizations to recognize important historical figures of Tustin’s rich history. The perceived method would be the erection of a bust of the noted individual in or near the location related to that person. An interesting idea, especially if you can get someone else to pay for it. It’s questionable whether that should be the taxpayer, however. The city is looking at selling two four-plex apartment buildings it owns to Orange County Rescue Mission. The $533,000 price tag is probably well below market value but is the original cost to the city. The city also derives nominal rent they will be foregoing. The tradeoff is helping at-risk veterans. And, although the city will carry the loan for the property at a nominal three percent, the note will diminish so that OCRM will, in effect, owe nothing on the proeprty. The only issue would be that the property was initially purchased by the city for the extension of Newport Avenue to the south. Should that project ever come to fruition (we’re banking on a “no” from the other property owners), the city will take the property back. So, there you go. It’s good to be back in the saddle…..er, back at the keyboard. We look forward to another year of mediocrity from the Tustin City Council as we forge ahead into another year. May you all have a Happy Christmas and/or Chanukah and a prosperous new year. It’s a long post, but we have pictures – ed. 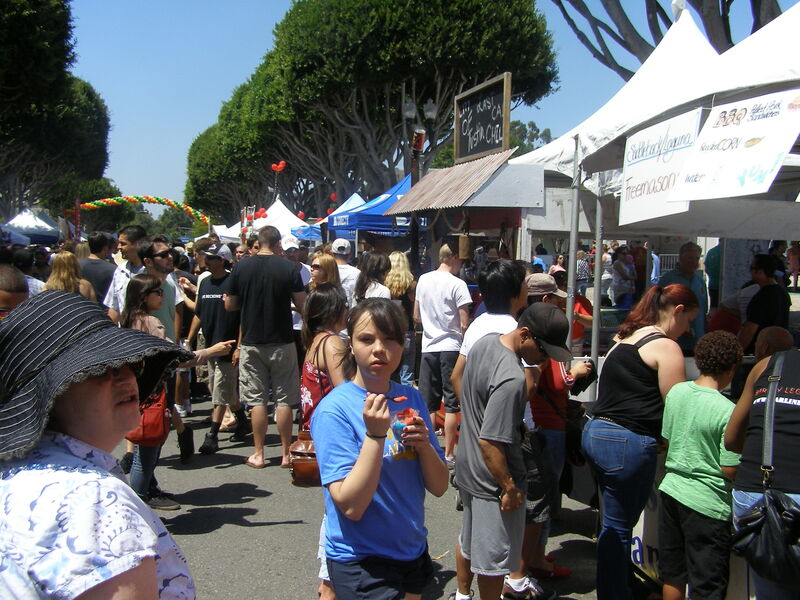 The nice thing about living in Old Town Tustin is that, anytime an activity like the Annual Tustin Street Fair and Chili Cookoff or the Broadway in the Park happens we can just go. We don’t have to worry about parking (although, after I heard some people were being charged $10 for parking, I may just open my driveway up next year). We don’t have to worry about planning our day or being away from the house too long. We just get up and go when we are ready. So, of course, the Chili Cookoff last weekend was a natural for us. Keep in mind, we do not go to these events to find the local politicians and other folks whom we often write about in this blog. But, when opportunity arises, we will take full advantage of it. We’ll get to that later. Over the years, we have found that it is better to go early rather than later. Although it may sound cooler to go later in the day, you miss a lot of stuff by waiting. For example, the music and entertainment are always better when the bands are fresh. And, this year, they had at least three stages we saw with entertainment going on almost all the time. 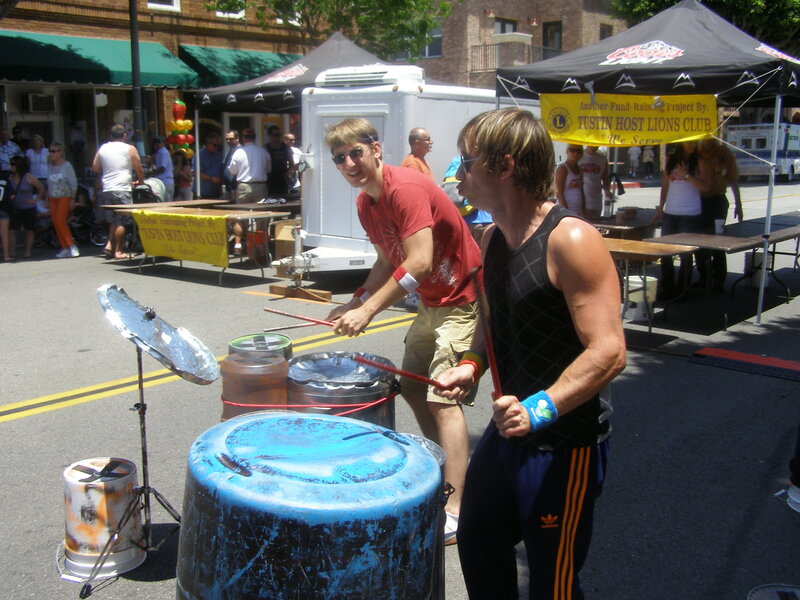 The best, however, was when we stopped on Main St. for some chili and found ourselves next to a trash can percussion band. We didn’t get their names but, they were one of the best we’ve heard. They later played in front of the main stage but their prior impromptu banging near the chili booths, seemingly as a warmup, was great. Of course, we had to sample chili. And, sample chili we did. This is another reason we have found to come early: the chili, at least the best chili, usually runs out by 1 pm or so. This year, the chili gods must have been listening as most of the chili cookers were still serving long past 2 pm. There is no such thing as too much chili in our book. So, we were happy to see there was plenty to go around. If Chili wasn’t your thing, you still had plenty to choose from. Commercial enterprises like Der Wienschnitzel and Tasti D-Lite were there, along with a lot of fundraising booths touting their various causes from cheerleading to dance to breast cancer awareness. 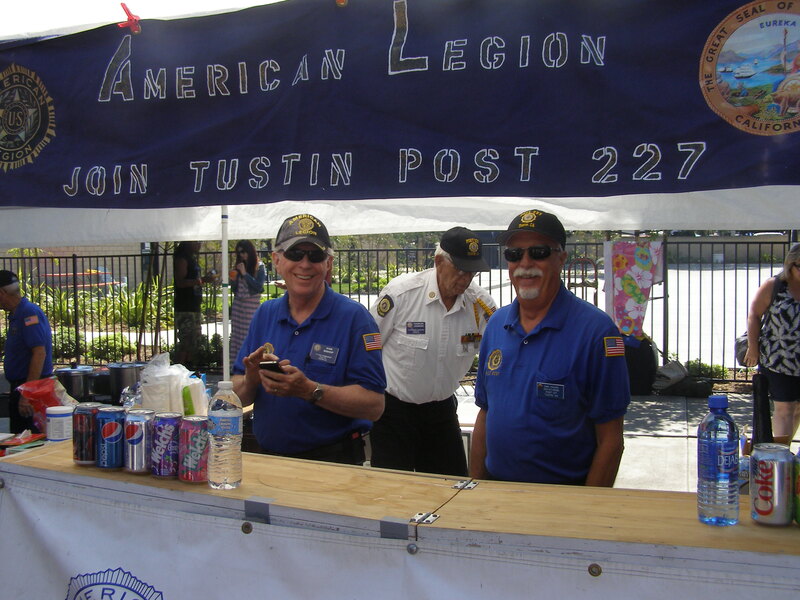 Even The American Legion Post 227 was there, as usual. Although I belong to a different post, I used to be a member of this one and all of these men and women are great friends of mine. They do a wonderful job of presenting and supporting veterans causes in our community and are always looking for new members. In fact, while I was at their booth, a young man approached and asked, “What is The American Legion?” I was happy to share with him and he explained that he had joined the Army and was about to be deployed. I thanked him for his service and handed him over to one of the guys to sign him up. Last I heard, Post 227 gives free membership to all active duty members of the Armed Forces. Way to go. Many of these booths offered every kind of food from bratwurst to bagels. Although we collectively saved our palates for chili (yes, we are connoisseurs and make our own award-winning brand of chili), all of the food smelled delicious. The price was right, too. A gripe I have about the Orange County Fair is the outrageous cost of food, as if profit is king. The idea of fairs should be to provide great entertainment and food at a reasonable cost. And, that is where the Tustin Street Fair and Chili Cookoff really shines. You can go and have fun, eat chili or other fair type food that is prepared with more heart, and enjoy a great day without breaking the bank. On top of that, the profit goes to local charities and efforts, not into someone’s pocket. Oh, and did we say the street fair is dog friendly? We take Amber the Wonder Dog with us each year we go. With her backpack, she is self-sufficient, carrying all of her worldly needs. Snacks, water and doggy-doo bags fit neatly into her backpack and she is ready to go. Of course, she met lots of people who were more than happy to pet her and fawn over her like their own dog. We are fortunate. There is only one Amber the Wonder Dog and we own her. But, we happily share her with others. And, ours wasn’t the only dog there. I counted over fifty that Amber made friends with (and a few she didn’t… but, no incidents), all having a good time on a very nice day. With temperatures not too hot, all the dogs were having a good time. We would also like to mention that some of our downtown shops are dog friendly. Since they opened, Free Soul Cafe on Main Street, has welcomed dogs to its patio while their owners enjoy both vegan and non-vegan delights from their bakery and selection of coffees. And, while sitting down and eating a little chili with my ale (Blue Moon, of course), a woman approached me, asking if my dog was a Rhodesian Ridgeback. Why, yes, she is part Ridgeback. 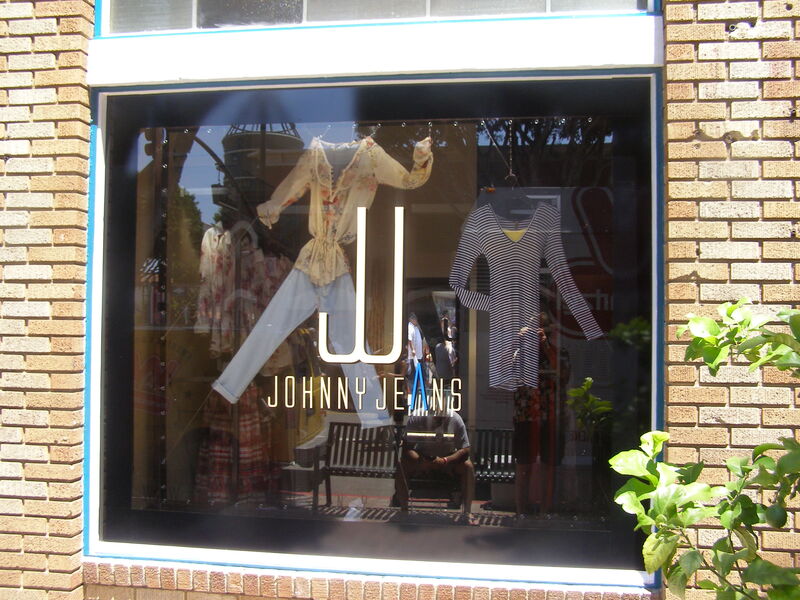 So, we talked for a few minutes during which she told me about Johnny Jeans, the new shop right next to Quinn’s Old Town Grill. It seems the owners have a Rhodesian Ridgeback named Johnny. Apparently, they love their dog so much, they named their shop after him. Unfortunately, the namesake wasn’t there at the time. But, they invited Amber in and gave her plenty of attention. They wanted to make sure we told you they are dog-friendly as well. So, this was turning out to be a great day. The temperature was just right, chili was flowing and we were having fun. 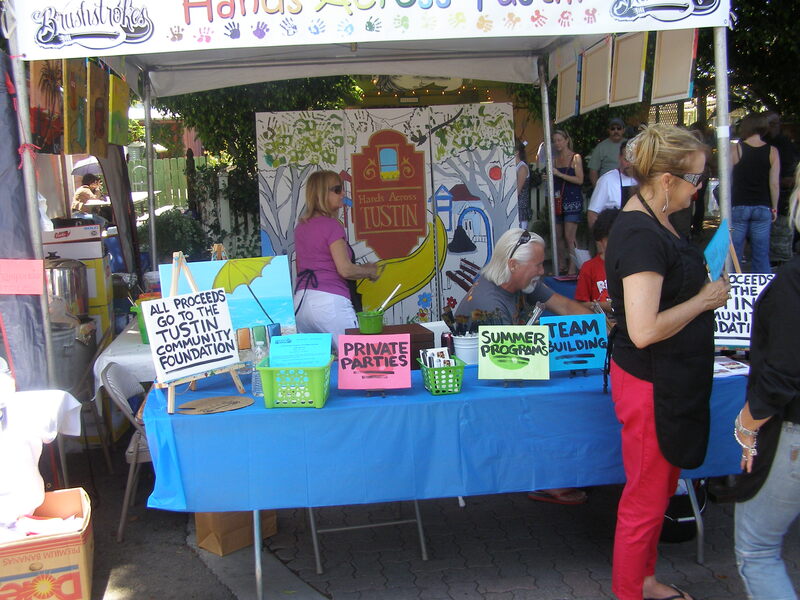 We even stopped by the Tustin Community Foundation Booth and took a look around. The folks were busy doing whatever foundation folks do. So, we didn’t want to ruin their day by announcing who we were. It is too bad they couldn’t reciprocate. Remember how we told you that we did not go around looking for politicians (most of whom were gathered around the chili judging tables)? OK, I admit, I saw a couple of Todd Spitzer’s supporters (none from his arch-nemesis) hanging around a chili booth and I asked if he was there. “Uh, yeah, he’s here somewhere. I just saw him.” It was unfortunate that we saw several of our local politicians, including Boss Tweed Amante and his heir apparent, Alan Bernstein, acting like celebrity chili judges. Even former councilmember, Doug Davert took time off from his busy schedule defending Trinity Broadcasting Network and himself, to judge chili. Gosh, thanks Doug. Say hi to Brittany for us. Imagine our surprise to see another chili judge, Councilmember, Deborah Gavello, having apparently just been assailed in public by Erin Nielsen, Executive Director of the Tustin Community Foundation and wife of Mayor John Nielsen. We asked, but no one was saying much (city employees like their jobs). All I could get was Erin calling Deborah “bad” or something like that. The only thing Gavello would tell me in a brief email later was that it was a misunderstanding. OK, we’ll go with that. But, we have to wonder if she is taking a clue from Boss Tweed Amante and falsely accusing others of collusion as well. So just to put things straight, Erin, if this is about the blog, your anger is misplaced. Ask your husband and he will tell you, I get all the information I need from the plethora of public records requests I make. Oh, and the TCF website, of course. Kudos to your webmaster (can I get on the mailing list?). Preferring to miss the throngs leaving the area, we finally left the street fair around 4pm. 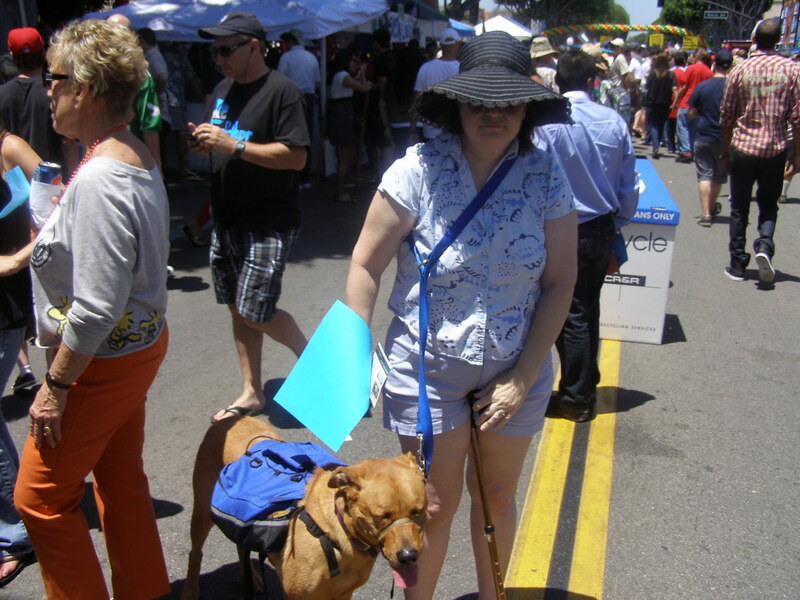 We had a great time and, unlike the OC Fair, are already looking forward to next year. It seems like a long way off but, we’ll have Concerts in the Park and the Dinosaur Dash to keep us busy until next year. Oh, and our kid will be auditioning for Broadway in the Park. Erin’s not on that board, is she? If you have been reading Our Town Tustin over the past few months, you know that we have been highly critical of the involvement of the Tustin Community Foundation in the administration of the Community Development Block Grants. Since 2007, the TCF has been designated the “Citizen Participation Committee” for this program. That means, they are pretty much allowed to recommend what community programs will be allocated funding for each period of the block grant. In an email/voicemail discussion with Tustin Community Development Director, Elizabeth Binsack, she explained that the TCF is charged with holding one of two public hearings and then, based on those hearings, they make a recommendation to the City Council on how those funds should be managed. To be fair, the City Council is not required to abide by the recommendations of the TCF. In fact, the City Council, according to Binsack, holds the second of the two public hearings themselves. So, anyone not getting the recommendation from the TCF has another chance at a slice of the pie with the city council, right? Except, there is this relationship between the Executive Director of the TCF and the Tustin Mayor which, we find it hard to believe would not have some influence on the decision making process. And, while Binsack did say the city council has occasionally gone against the recommendations made by the TCF, she did not offer any examples where that has happened. Prior to April, 2007, CDBG fund allocations were recommended by a Citizens Participation Committee consisting of various leaders of other city committees, commissions and two at-large members. This was amended by the city council to designate the TCF as the CPP for all public service projects. And, while John Nielsen had not been elected to the council at that time, he was a planning commissioner for the city and had certainly made his intentions to run for city council known by then. Oh yeah, and the planning commission had a representative on the CPP when John was a commissioner. So, does the Tustin Community Foundation “manage” Community Development Block Grant funding? The short answer is, no. They do not actually have hands on management of the funds. 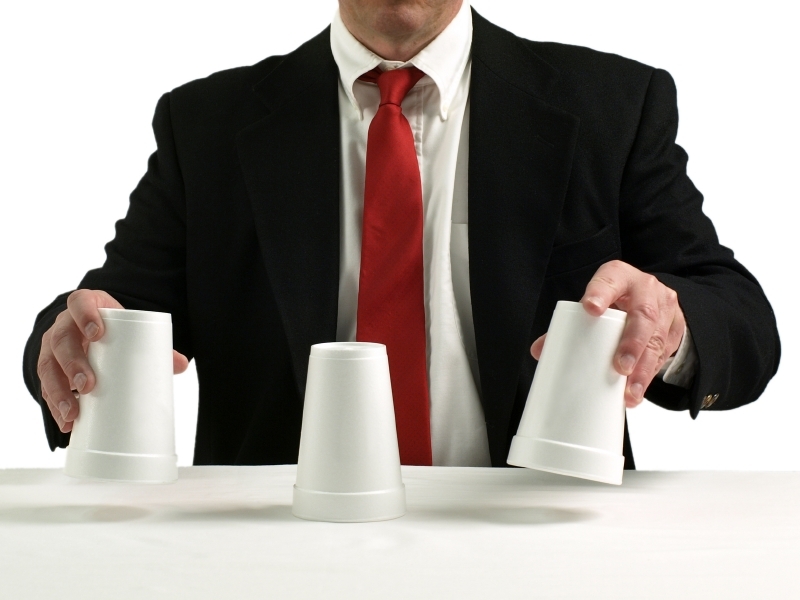 However, their role in the decision-making process is much more integral. They hold so-called public hearings and take input from community representatives. They then make recommendations that, by the city’s own admission, are almost always followed. This takes us back to ethics and conflict-of-interest issues. What is a problem is the fact that Mayor John Nielsen’s spouse, Erin Nielsen, is the Executive Director of the TCF. I checked with my political rabbi concerning any conflicts of interest regarding this issue. What he told me was, while their may be no specific conflict of interest that rises to the level of a violation, there is certainly the perception of one anytime there is a direct relationship between entities such as this. And, if the perception issue is not bad enough, it is about to get worse. Guess who’s coming to dinner? Both former Tustin Mayor Chuck Puckett and Alan Bernstein have declared their intention to run for Tustin City Council. Chuck Puckett, has ethical baggage of his own that involves negligee shows and city credit cards (at least he shopped locally) during his last tenure on the city council and was, until recently, listed as President of the TCF Board of Directors. We notice he no longer has a position on that board. Somebody must have mentioned the baggage that would carry. Bernstein, on the other hand, is a friend of former Mayor, Jerry Amante and actually lives in his neighborhood. He also recently received an exemption for his daycare business to allow more children at the home. It is safe to assume that Amante has the ear of Bernstein and is probably well established in the shadow government of Tustin. But, the real issue remains. How long will John Nielsen be allowed by the community to exercise decision making over CDBG funding with his wife, Erin, at the helm of the organization that has the most influence? It would be a simple matter for the good mayor to recuse himself from all votes regarding this portion of the CDBG funds, thereby giving him clean hands on the issue. The question is, will he work for the betterment of Tustin through ethical decisions or will he continue to exercise control over the issue, ehtics be damned? We would like to know what you think on this issue. Your comments are welcome and can be made anonymously under any name. Your email is not published and, to the extent the law allows, this blog will never divulge your name or other identifying information without your permission. First time commenters are moderated only to limit spam and OTT has no control over that matter (it’s a software thing). We will not edit comments and will publish them as written (spelling counts here). So, comment away.